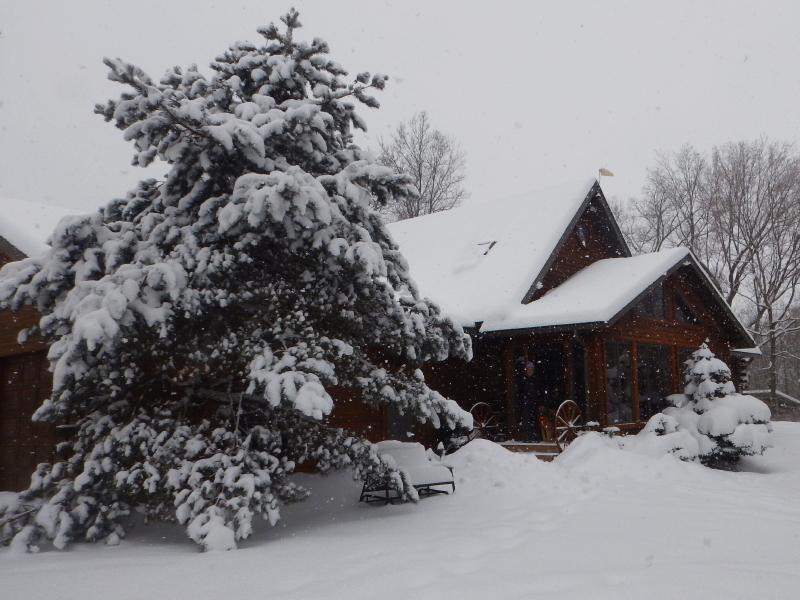 Two all day things: It snowed all day yesterday and we shoveled all day. It’s beginning to look a lot like Christmas around here! On Wednesday night, we noticed all the school districts in our vicinity were announcing they would be closed on Thursday, so I decided that was a pretty good clue that I shouldn’t try driving to the day-job. As a result, I am going in today, in a swap of days for my 4-day work week. Sitting at my desk today will be a welcome relief from the strenuous exercise of shoveling for hours on end. 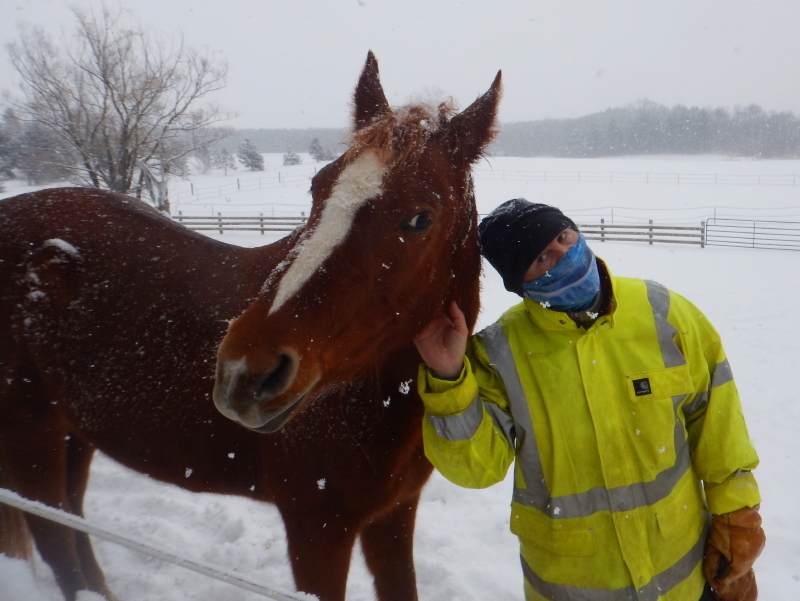 I took a little break to see what the horses thought of all these flying flakes. Cyndie caught a picture of Dezirea and me giving each other the eye. 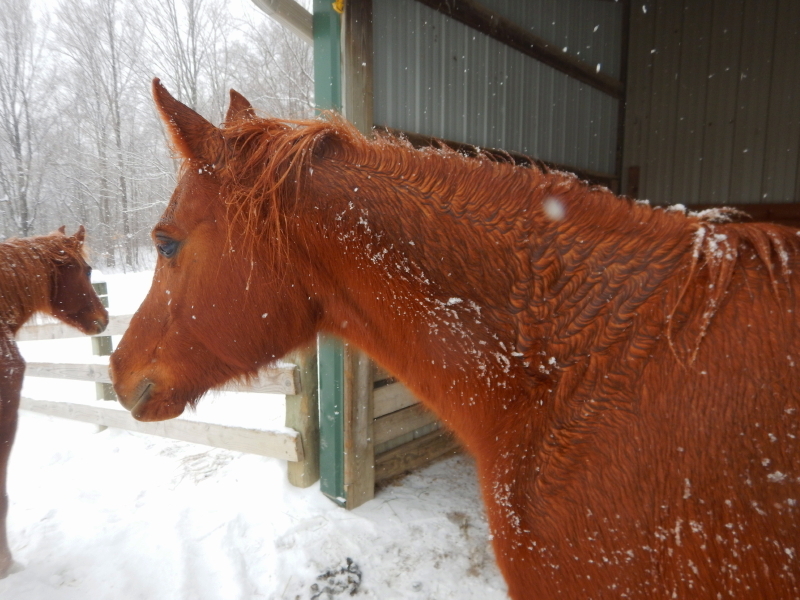 I think the horses were growing weary of the long duration of snowfall. Cayenne was sporting some cute curls in her long wet winter growth. I got out the snowshoes to walk Delilah on our trails through the woods. She was so fired up to be out in the deep snow that she wanted to run, but I couldn’t keep up with her at that pace. I felt bad slowing her down. The chickens showed no interest in leaving the coop. I snowshoed all around the coop to pack down the snow for whenever they decide to come out again. It’s probably going to be too cold for them today, but eventually, they will get tired of being cooped up (literally!) and venture out into the world again. We have one Buff Orpington that doesn’t seem to be her normal self. We think she may have scrapped with that possum and be suffering some ill effects as a result. Cyndie couldn’t see any obvious physical wounds, so we have decided to just keep her comfortable and see if time heals whatever might be bothering her. Today, I’m hoping to not do any shoveling all day. I’m expecting to be confused by this disruption of my normal routine, commuting and being at work on a Friday. I expect it’s going to make my weekend seem unusually short, but my body will appreciate today’s break in the manual labor of property management chores.